Drivers are advised to avoid the eastbound M180 today as there are still long delays on the M180 and A18 due to ongoing carriageway reconstruction work taking place on the motorway between junction 2 and 3. The motorway is currently closed eastbound between junction 1 and 3 and there are severe delays on the M180 and along the A18, which forms part of the diversion route. I am very sorry for the long delays experienced over the last two days. My team are revising the schedule to allow us to accelerate the construction work, which will enable us to open one lane of the eastbound M180 by 6am tomorrow morning (Friday). I acknowledge that these closures have been very disruptive to drivers and residents and that the routes around the closure have been heavily congested. To help alleviate the congestion we have agreed with Humber Bridge Authority to suspend the tolls for the next 24 hours to smooth the flow of traffic along the A63 and the bridge and provide a non-tolled alternative to the east coast for drivers avoiding the M180. 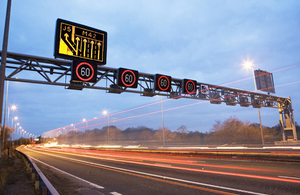 Overhead motorway messaging signs have been set across the region on the A1, A1(M), M62, M1 and M18 warning of delays. Those travelling from the south should consider using the A46 and A15. There is an alternative diversion route signed from the A1 at Blyth and Wadworth warning the M180 closure and advising drivers heading to Grimsby to use A641 / A631 and A15. Those travelling from the north can use the M62 and A63 to the east coast. Drivers are advised to plan their journeys around this area, leave plenty of extra time, and make sure they and their vehicle is prepared in case of delays, with plenty of water and fuel. The work taking place on the M180 is essential carriageway reconstruction work, which began on Wednesday morning. It requires deep excavations and repairs to the concrete foundation of the motorway. The concrete needs time to cure and then a number of tarmac layers must be laid on top, which need to cool before traffic can run on it. The 24 hour closures planned to take place in two weeks’ time will now be reassessed and re-planned to ensure a repeat of this situation does not occur.